In 2015–16, vegetable and potato production was valued at $2.1 billion. Major crops include potatoes, carrots and lettuce. Australia’s diverse climate and soils accommodate vegetable cultivation in all states and territories, ensuring a constant supply of fresh vegetables. 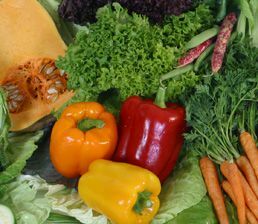 Australian vegetable growers provide the majority of fresh vegetables consumed in Australia and an increasing amount of fresh vegetables consumed overseas. The Australian vegetable industry is committed to building its capacity to respond to potential biosecurity threats. A vegetable industry Biosecurity Advisor, and two full-time Biosecurity Officers allow the industry to participate in a range of biosecurity initiatives. During 2017, the Vegetable and Potato Biosecurity Officers visited growing regions across Australia and held a series of biosecurity awareness seminars. Farm biosecurity planning resources have been reviewed and updated to reflect industry needs. The Officers are also working with PHA to develop a potato Owner Reimbursement Cost Framework and a potato grower biosecurity manual. Other biosecurity initiatives include participation in technical meetings with the Department of Agriculture and Water Resources as well as engagement with other government departments, committees, bodies and PHA. AUSVEG provided advice in the update of the potato and vegetable industry biosecurity plans. 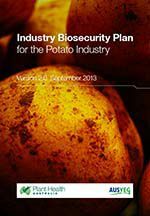 The Australian vegetable industry is covered by version 2.0 of the vegetable biosecurity plan, version 1.0 of the potato biosecurity plan, the Farm Biosecurity Manual for the Northern Adelaide Plains Vegetable Growers Version 1.0, the Biosecurity Induction Manual for Bundaberg Horticultural Farms Version 1.0, and the Potato Growers’ Biosecurity Manual Version 1.0. Biosecurity planning provides a mechanism for the vegetable industry, government and other relevant stakeholders to assess current biosecurity practices and future biosecurity needs. Planning identifies procedures that can be put in place to reduce the chance of pests reaching our borders or minimise the impact if a pest incursion occurs. 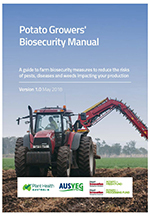 Manuals usually contain an overview of biosecurity, fact sheets to identify the high priority pests of a crop, tips on crop management, and how to manage people, vehicles and equipment to minimise biosecurity risks. Manuals also contain a biosecurity self-assessment list, and templates to record pest surveillance records and visitors. The Potato Growers' Biosecurity Manual is based on the six 'essentials ' of on-farm biosecurity: people, vehicles and equipment; farm inputs; farm outputs; feral animals and weeds; production practices; train, plan and record. 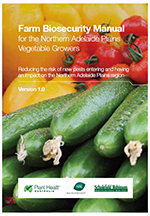 The Farm Biosecurity Manual for the Northern Adelaide Plains Vegetable Growers contains information to help producers to implement biosecurity on-farm. 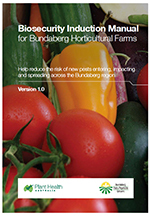 An integral part of the Biosecurity Induction Manual for Bundaberg Horticultural Farms is the 'Induction and farm biosecurity risk checklist'. The following is a list of high priority exotic pests of vegetables (including potatoes). These pests were identified during the development of the Industry Biosecurity Plan for the Vegetable Industry and the Industry Biosecurity Plan for the Potato Industry in consultation with industry, government and scientists. They have been assessed as high priority pests based on their potential to enter, establish, and spread in Australia (eg environmental factors, host range, vectors) and the cost to industry of control measures. The following is a list of documents for other exotic and endemic pests of vegetables (including potatoes). Please note that this is not a complete list of pests: rather it includes pests for which documents exist in the Pest Information Document Database. Some of the documents presented here are not tailored to the vegetable industry and are included for information only.